Venice Family Clinic hosted its annual Silver Circle Gala at the Beverly Wilshire Hotel, where it raised more than $1.5 million to provide quality and affordable healthcare for almost 30,000 low-income men, women, and children annually across Los Angeles County. 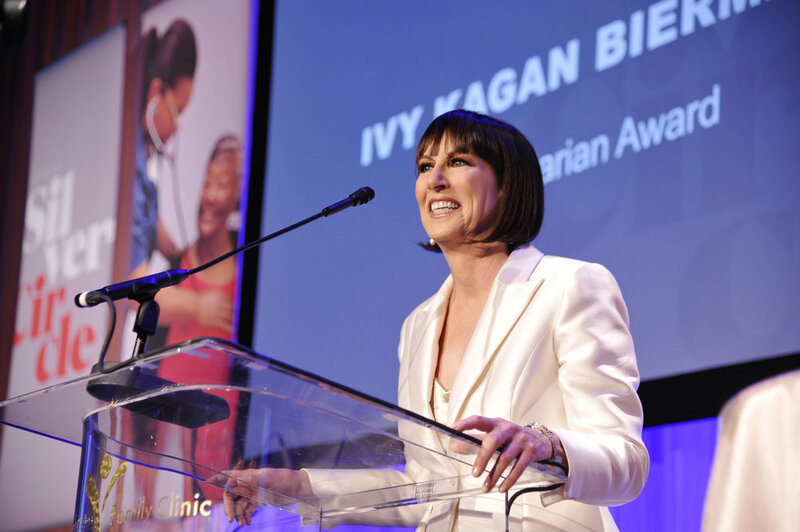 Ivy Kagan Bierman received the organization’s prestigious Humanitarian Award for her commitment to empower women and minorities, fight for justice, and advocate for greater equity for women and minorities in the workplace. Ivy is a partner at Loeb & Loeb LLP, the Vice Chair of Civil Rights for the Anti-Defamation League, and is a member of the Legal, Legislative and Policy Committee on Sexual Harassment and Gender Parity, and the Safety Committee, for Time’s Up. Her work is centered on a myriad of matters related to the #MeToo movement while conducting cultural assessments for various organizations to help them shift their office cultures. The gala, which celebrated minorities and women helping other women, highlights the importance of the clinic’s mission of providing quality healthcare for low-income and uninsured families, as well as offering a range of women’s health services. Now in its 37th year, the evening began with a lively cocktail hour, followed by a three-course dinner, and concluded with live performances from Grammy-nominated jazz artists, Carmen Bradford and Shelly Berg. The organization also honored architect Russel Tyner of Houston/Tyner with its Irma Colen Leadership Award for his three-decade-plus-long support of the clinic through both volunteer work and pro bono efforts designing its medical facilities. Guests at the gala, sponsored by UCLA Health and the David Geffen School of Medicine at UCLA, included entertainment attorney and Time's Up founder Nina Shaw and Grey’s Anatomy actor Alex Landi. More than half of the patients the clinic serves are women and they are committed to providing excellent care to address their unique medical and health needs and ensure they are treated with dignity and respect. Launched in 1970 by volunteer physicians Philip Rossman, MD, founder, and Mayer B. Davidson, MD, co-founder, Venice Family Clinic first operated out of a borrowed storefront dental office after normal business hours. It is now the largest community health center on the Westside. Today, with 12 locations, Venice Family Clinic is the health home for families and individuals who might otherwise go without the care they need.